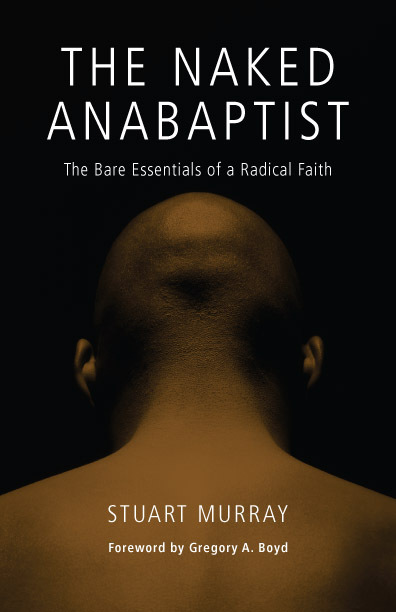 The Naked Anabaptist: The Bare Essentials of a Radical Faith / Stuart Murray (Herald Press, 2010) 143 p., RRP AUD25. If someone asks what an Anabaptist is, the temptation is to begin with a history lesson about the sixteenth century Reformation. The problem is that you only have about thirty seconds of someone’s attention, and you’ve spent it all just trying to get some bare bones down, differentiating the original Anabaptists from the other Reformers. No time to draw the connections to what that means for today. Stuart Murray avoids this problem by saving the history lesson to the penultimate chapter, and it works. He lays out what an Anabaptist is today and gives some minimal historical background, before finally unveiling the whole history at the end. A much better approach for your average listener/ reader. Murray is a generous writer, starting with a number of quotes from people who have come to Anabaptism, including friend of this blog, Phil Wood. In his opening chapter, he also deals with a lot of ‘But aren’ts’ that I’ve certainly heard a number of time – ‘But aren’t Anabaptists just another denomination?’; ‘But aren’t Anabaptists hung up on the issue of baptism?” ‘But aren’t Anabaptists separatists?’; ‘But aren’t Anabaptists all pacifists?’ (Answers: No, No, Sometimes but No, and No but Yes.) This chapter also helpfully surveys the influence of Anabaptism beyond the Mennonite Church, in countries like Britain and Australia without a Mennonite presence – including, gratifyingly, a mention of On The Road, the journal I edit for the Australian and NZ Anabaptist Association. From my perspective, Murray gets the essence of Anabaptism just right. He deals with the centrality of Jesus for ethics and reading Scripture. He explains the Anabaptist critique of the church-state alliance and the appropriateness of the Anabaptist model of doing things for our post-Christendom context. He explains an Anabaptist vision for the church, with accountablility and multi-voiced congregations two key elements. He then sums up the Anabaptist focus on justice and peace as central to the gospel rather than consequences of it, or added extras. His brief history of the Anabaptist movement is well handled, giving an outline of the differences between the three different geographic origins of the movement in Europe and explaining the denominations which arose out of this. He finishes the book by exploring some of the weaknesses and criticisms of the movement and affirming its value for today. It’s interesting that one of the weaknesses of the movement he names is ‘intellectualism/ anti-intellectualism’. The conservative, simple living communities which have guarded Anabaptism for centuries tend to be anti-intellectual – Amish, for example, certainly don’t have much time for intellectualism. In contrast, neo-Anabaptists tend to have a very intellectual approach to Anabaptism and may have come to the faith by reading (as I partly did). A minor quibble I have with the book is the lack of an index. (In my copy I constructed one of my own, penciling in an alphabetical list of some of the more interesting subjects covered. ) The book looks attractive, though, and has a foreword by popular pastor-theologian, Gregory Boyd, hopefully meaning it will sell well at Christian bookshops. I think everyone who has an interest in Anabaptism but doesn’t quite understand it (or can’t quite put the different threads together) should read it. For everyone identifying with the movement, it’s an excellent book to buy in order to lend out. It’s an especially important book for Australian Anabaptists, written as it is from the same context we find ourselves in – Anabaptists-by-choice, without a church. I asked Koorong to list it; they have, but they’ve only ordered the one copy I asked for. If you order from them, it might even inspire them to stock it on their shelves. If you are buying online from Australia, the best price is at Book Depository; at today’s exchange rate, it’s only $15.96, including postage. It was a fascinating episode of Insight on SBS last night, as audience members put their views on the pilot ethics program in NSW public primary schools. The ethics program runs as an alternative to the ‘scripture’ classes (or whatever religious classes are being offered at a particular school). I was impressed by the standard of the debate; a lot of incisive points were made, and the rather simple American fundamentalist only got to speak once. I don’t think the Christians have a particularly strong case for objecting to the program. The problem is that children whose parents don’t want them taking religious instruction are left with nothing to do; the secular ethics class gives them an alternative. The North Sydney Anglican bishop Glenn Davies wanted the framework behind the ethics class made transparent. Or perhaps his concern was that it wasn’t giving students a moral framework with which to make ethical decisions. (This is a question I have too.) He also wanted ethics discussed by all students, including Christian ones, so that those students with a religious worldview had a voice. The situation is complex in post-Christendom.